These two species belong in the family Tyrannidae. They are easily confused because both have a grey head with a black line across the eye and their underparts are yellow. When the bird is facing these parts cause confusion. The bill may be a clue for a right guess. 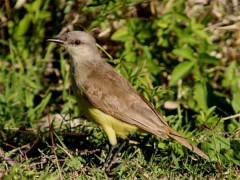 It is much more robust in the Tropical Kingbird and it is also hooked at the tip. Two other clues which help: habits and the season they are seen. The Tropical Kingbird never gets off the trees. The Cattle Tyrant, instead, makes short runs with upright posture to hunt insects, but it can also frequent trees. In fact, it builds its nest there. 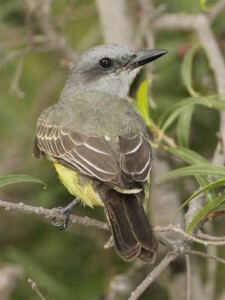 The Tropical Kingbird comes to the south to spend the summer and breed. There are breeding records at Costanera. 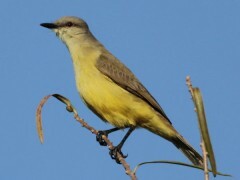 The Cattle Tyrant is a resident and can be seen the year round. The song is not a minor fact, but it is always mentioned at the end just in case they keep silent. The Cattle Tyrant has a high-pitched contact voice. The onomatopoeic name of the kingbird comes after the song it emits. 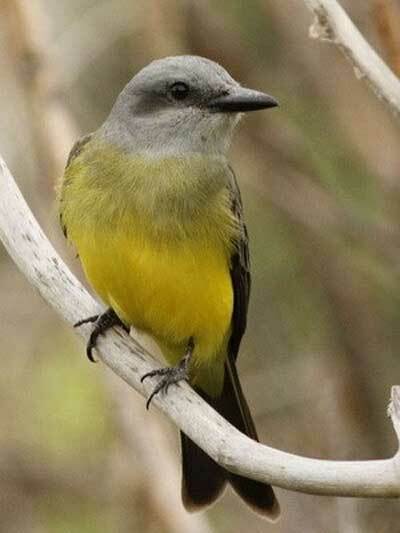 List to the Tropical Kingbird. So it is summer and the bird is in a tree, take your time before guessing.